Imagine turning 3D models into VR scenes, and imagine doing it in less than 5 minutes. Unbelievable isn't it? Now it's all possible with AmbiensVR, the innovative tool that allows you to transform a static model into an interactive experience in real time and available on all platforms, web included. Install AVR Plugin, push the AVR button and wait less than five minutes for the magic to happen! Once your 3D model is VR-ready, you will be able to add any interaction you may need. 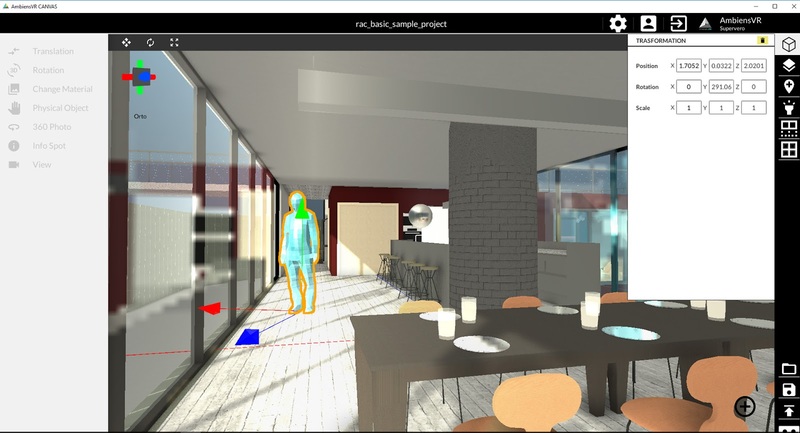 AmbiensVR provides specific tools to edit your model, choosing interactive items such as sliding doors, opening doors, switching-material furniture. Version 0.9.0, 1/14/2019 – First Release. The AmbiensVR Revit add-in is free. Pricing for AmbiensVR is as follows. This add-in is compatible with Revit 2019, 2018, and 2017.